I saw this question/status posted on a friends timeline the other day. It wasn’t my first time reading it. But reading it again just gave me a huge reminder of where I have been on my journey as a Stay at Home Mom (SAHM). Mommy shame hit me so hard. Trying to balance the life of work and the life of a mom. My daughter would come to work with me as well. But since my children are 5 years apart in age, it was much easier having her there. She truly is my angel child. She’d help around the office, get her own stuff done. Play with other children as they steadily came in and out the door throughout the day. But my son, as cute as he was, he was just really loud. At one point, the wall we shared with the office next door, could hear when my son cried that the occupant who sat there had to come to our office to begrudgingly ask that we quiet down the baby. I cried that night. Hard. My husband and I later that week sat down and reviewed our finances. He had just been given a promotion. With it a raise- one that included an even higher bonus that came quarterly. We compared the cost of enrolling 2 children in daycare, the amount I would make doing the work that I did, and the amount of money my husbands new income would be. Turned out that me working would almost break us even just to pay for daycare. I essentially would bring in NO income. I would literally be working to pay for daycare, and for the gas and lunch that I would need during the work week. So we agreed. Me staying home was the more financially sound option. His raise would be enough to hold us over. And just like that, one day I had my last day at work. The next day, I woke up being a stay at home mom. This world was new, scary, and eventually as I learned, extremely lonely. I’ve heard the arguments before. All of the mommy wars stories and tales of SAHM’s versus Working Moms. Well as a mom who has been a teenage mom, a single mom, a working mom, a mom of a child with special needs, and, of course, a stay at home mom, I can say that I have experienced it all. With that, there is no comparison between either type of mom that exists. It is all hard. Let that sink in as I repeat myself again: MOTHERHOOD IS HARD. It’s hard not because of the obstacles one faces as a “X,Y,Z” type of mom. It’s hard because that mom has maxed herself out period. Doesn’t matter what type of mom she is. Raising little human beings from the womb until adulthood is a lot of work. Motherhood is different for everyone. The decision for me to become a SAHM didn’t come about because we decided I was too good to be working, and we poop money out left and right. I’m not pampered (materialistically). I don’t do what I want, when I want, just because I’m at home. My house is constantly messy, my voice is constantly on volume 100, and the laundry is almost always “behind”. Every type of mom there is, we all face different shitstorms Every. Single. Day. So when I read the meme the first time around, as a working mom, I laughed it off. It was just a meh kind of thing. I moved on. But then it became my turn. It was no longer just a meme. This was my life. Being thrown into a new way of life, one I’ve never planned for, it took me by surprise just how LONELY life was as the days rolled by. I mean, I have 2 kids with me constantly though. How could I possibly be lonely? Well, it just is. Talking with patients throughout the day, I knew why certain patients couldn’t make appointments on specific days or at specific hours of the day because I knew their personal life routines. I knew them. I had conversations with them about my life day in and day out. I laughed with my co-workers about random things. I’ve cried a few times too. We talked about everything throughout the day. I got a chance to miss my babies and happily expect to spend time with them once I got home after work. My husband and I got to share about our days and life was just balanced and it was well. Not perfect though. I really missed my kids. Mommy shame would kick in constantly on how my kids were growing so fast and how my nanny was raising them because I was at work. But like I said, I’ve been a different type of mom throughout my journey in motherhood, and each season faced different obstacles. A few weeks into this season though, it just hit me like a brick wall. I had no adults to talk to. My poor husband had to listen to me complain about the children throughout the day. I’d call him, text him, and on occasion drop by his work in the middle of the day just to vent to him about the kids. He’d definitely come home to me going a little crazy. Trying to clean up after the kids. Trying to cook dinner. Trying to get bath time done before bed. Trying to catch up on laundry (gosh I hate laundry). Trying here, trying there, trying a little bit of everything everywhere. I was putting myself into a hundred different places throughout the house, I spared no time for myself. No time to chat with another human being. I solely spoke with my husband. And our talks became repetitive. Although he does a great job supporting me, at one point, this was simply no bueno and things needed to change ASAP. My husband eventually noticed just how much of me was lost. I definitely became depressed. I was a year into being a SAHM, and I still couldn’t get a good routine in place. I was still in the process of trying to figure out why my son couldn’t be still, or why he needed extra attention. I was still trying to homeschool my daughter before realizing that my sons needs detracted so much of my time away from my daughters. At some point the joy of motherhood was gone. It affected our relationship, our marriage, to the point where he simply said something needed to change. We were both so lost that I don’t even think he realized ever suggesting that maybe I should find a group to join. I’m sure he meant a support group like an AA meeting, only for depressed SAHMs. But, since I have the kids with me constantly, I just didn’t think that’d be the right fit. Instead I started a Facebook group. Just a group for SAHMs or moms that worked part time. Moms that would understand my loneliness. Moms that would relate to me during this season of life. I had other mom friends, but none that understood what it was like to be a SAHM. None that knew what it was like to KNOW something was going on with your child requiring several different appointments and evaluations and coming to no conclusion that was satisfying enough. No mom friend that understood how crushed I was when I had to give up homeschooling my daughter, enrolling her into public school while I dealt with all of the fears, and the pain of letting her down (my tune towards public school has changed quite a bit!). That’s what I needed, so that’s what I decided to create. My new mom friends since starting the group have been nothing but amazing. The group has been running for a little over a year now. Although it started off slowly, we began to grow in numbers, and even more so in genuine and authentic friendships. We get together for playdates. Sometimes we go out for moms night out. Other times we just throw ourself a little moms night in event. We get together, support each other, and answer all of the very easy to google questions about motherhood and the germs our children encounter simply because we can. We have leaned on each other for last minute babysitting needs. Sometimes we just chat online. Other times we take turns watching kids while one mom sleeps, cooks, or cleans. We give each other a break. We allow ourselves to enjoy the company of a fellow mom who simply gets it. Recently, a mom finally mounted up the courage to let a small group of us know that her husband has been battling cancer. Her life has flipped crazy upside down. So we quickly, and oh so willingly, started a meal-train to help take some of the load off her shoulders. We also sent a group of moms to help clean her house, while other moms (myself and a fellow mom friend) stayed behind to watch the kiddos to make it possible. When my daughter was hospitalized earlier this year, the support I received was freaking phenomenal. A few weeks ago my son was just driving me up the wall all day but I needed to grab groceries. A fellow momma said just drop him off, go shop by yourself. You’re good. Go. These ladies have become my rock. We talk about motherhood. We talk about our children. We (absolutely) talk about our spouses/significant others. We just talk. And now suddenly, motherhood isn’t lonely anymore. Suddenly life feels like I’m doing something right. So do what the meme says. 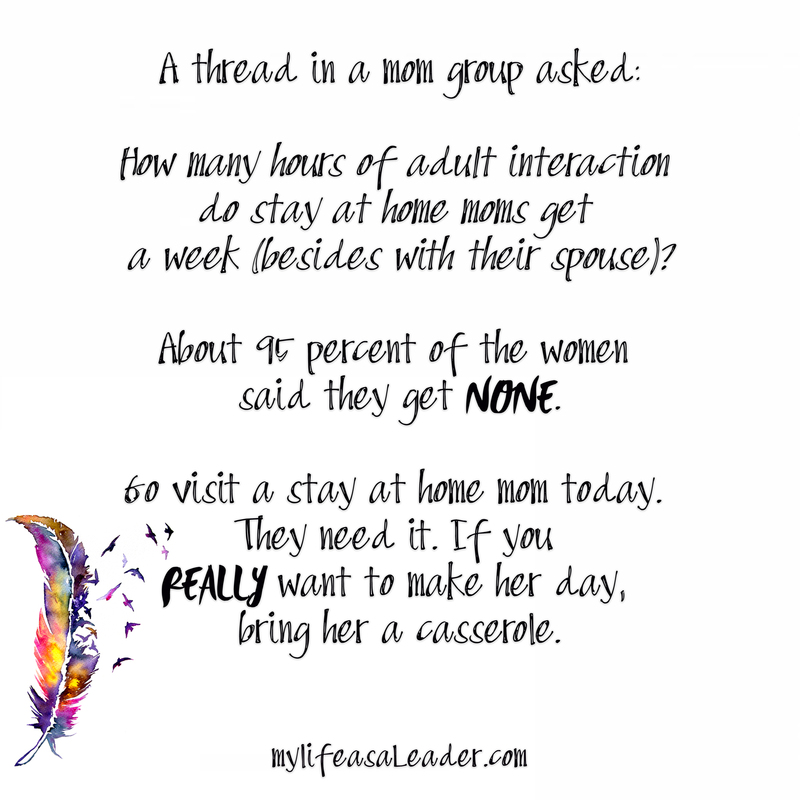 If you know a SAHM, chances are, that unless she’s in an awesome group like mine (just saying there’s simply no denying how awesome it is), ask her what can you do to brighten her day. It’s hard for us to confess we are losing our minds. We are supposed to have it all together. We are supposed to get it all done, and make life happen since we “have all the time in the world” now. Err. WRONG. We don’t. But that’s not the point. The point is, if you have a friend that is a SAHM, chances are she hasn’t been talking to you about the struggles she faces daily. Don’t let those fabulous Facebook pictures of her and her kids fool you. I’m pretty sure that she’s slowly drowning in her world that has micro holes all around. Slowly suffocating her and her voice. It’s not easy to confess we need this kind of help. Its not easy to accept help in general and much less to accept it. So please reach out. Do it often. Offer to bring food, coffee, or wine. And then just stick around and chat. Listen to her. Be willing to offer yourself to her a little bit more. The day you validate her and what she is doing, is the day that she has hope restored. It’s the day that she is made fully aware that she is doing something right. She’s worthy of adult conversations. And most importantly, she’s worthy of some damn casserole. Previous Previous post: ﻿Things my kids cry for during the worst times for no reason at all.